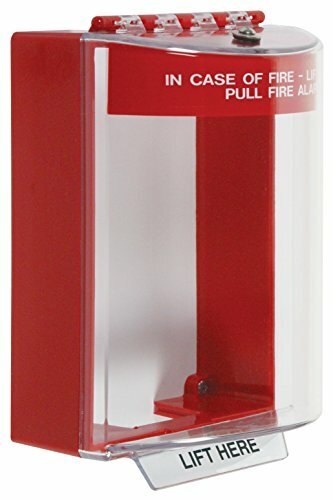 Safety Technology International, Inc. STI-13210FR Universal Stopper without Horn, Surface Mount and Fire Label, Indoor/Outdoor Polycarbonate Protective Cover - This unique Indoor/outdoor polycarbonate cover helps stop false fire alarms without restricting legitimate operation of pull stations. This tough polycarbonate cover is ideal for schools, hospitals, nursing homes, stores, hotels and public buildings of almost every kind. The strong, durable construction takes the toughest knocks while it guards against accidental or intentional physical damage. The cover is 4 inches in depth and clear, flush mount with a red housing. Sized to fit most pull stations. Fire label in bold white gives clear instructions on how to remove Stopper. Fire Label reads: "IN CASE OF FIRE - LIFT COVER PULL FIRE ALARM". It protects pull stations, keypads, intercom stations, emergency buttons, electrical light switches, etc. It is ADA Compliant and UL/CUL Listed for US and Canadian safety standards. Stopper is UV-Stabilized to keep cover clear from the elements. Three year guarantee against breakage in normal use (one year on electro mechanical and electronic components). Polycarbonate rated -40° F to 250° F (-40° C to 121° C). STI "We protect the things that protect you." Three year guarantee against breakage of the polycarbonate in normal use.